drivingandlife: FORD MAGIC! KUGA BECOMES ESCAPE! ABRACADABRA! 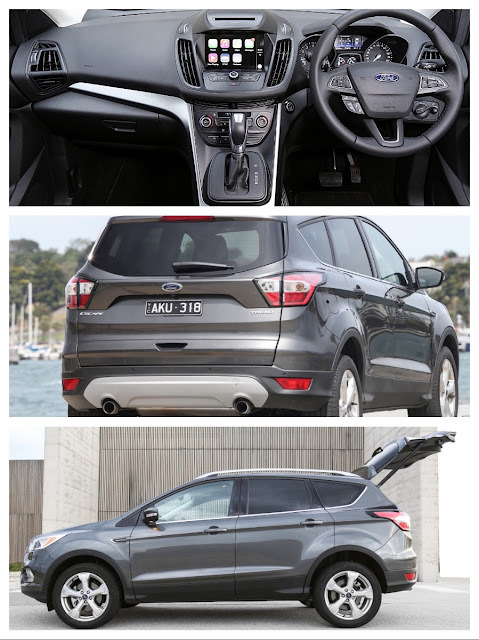 With one swish of the magician’s wand the Ford Kuga, magically turns into the Ford Escape. However, this magic trick is much more than mere sleight-of-hand. The ZG Escape comes with new standard equipment levels including rear-view camera; programmable ‘MyKey’; Sync3 plus Apple CarPlay and Android Auto; Digital (DAB) radio; rain-sensing wipers and auto on-off headlamps. There’s three versions; Ambiente, Trend and Titanium. However this Trend test car represents the best value, starting at AUD$32,990. This model uses the 1.5L EcoBoost engine with a useful 110kW; and the 6F35 six-speed SelectShift auto transmission, and front wheel drive. You can add more flim-flam, naturally for more dollars on the pricetag, but I think the standard Trend FWD with auto will be the big seller. The powertrain is particularly impressive, matching the turbocharged engine with the (joint Ford-GM) six-speed auto, and around the burbs it’s a good combination. You even get steering wheel paddles! Ford says the combined cycle fuel economy is 7.2L/100km, and in the first 100km we did better than that. Back to the magic trick. There was probably nothing wrong with the Kuga (except maybe the name), but it never seemed to do more than levitate above bare minimum sales numbers, because it participates in a highly competitive segment. The Escape brings back an old badge, but the facelift and the extra standard equipment indicates Ford is serious about getting better sales results in this segment. As Holden will soon become, Ford is now a vehicle importer only, and chooses appropriate models from its global catalogue, but Ford Australia was very smart in the way it handled the demise of the locally-manufactured Falcon. Ford Australia announced that the model name would die with the manufacturing operations, and that was very smart. This completely avoids the situation GM Holden is in, trying to ‘pretend’ that the Opel Insignia is ‘really a Commodore’ – when nothing could be further from the truth. GM would have been cleverer to let the Commodore name die this year as well. Ford’s new Escape is well-priced, well-equipped and delivers more than acceptable city performance, with all the versatility you expect from a compact SUV. It’s smart positioning, and smart marketing and I’d like to see it pay of for the Blue Oval.